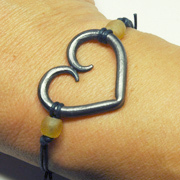 This darling forged steel heart bracelet makes a wonderful gift for ladies and teenage girls. Heart is strung on an adjustable black cotton cord with glass bead accents. One size fits most. If you have large wrists we can accommodate you. Please specify at check out under special instructions.